L.A. City Councilmember Mitch Englander (at podium) touts the city’s efforts to stem hit-and-run crimes at this morning’s press conference. Photo: Joe Linton/Streetsblog L.A.
Today, the Los Angeles City Council voted to approve two new city programs that aim to stem the tide of hit-and-run crimes. According to Los Angeles City Councilmember Mitch Englander, hit-and-run crashes killed 27 people in Los Angeles in 2014, and 80 percent of recent hit-and-run crimes remain unsolved. The city’s hit-and-run efforts were previewed at a press event this morning hosted by Councilmembers Englander and Joe Buscaino, with representatives of the police (LAPD) and transportation (LADOT) departments, and Finish the Ride’s Damian Kevitt. 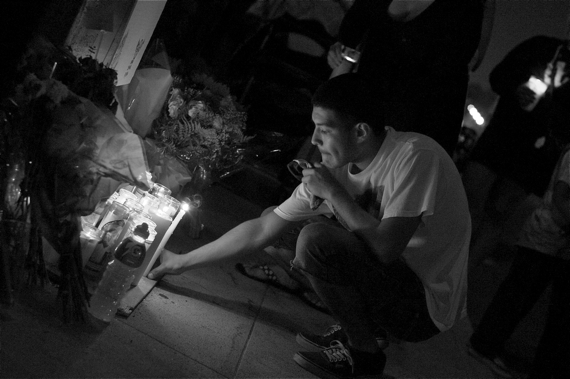 Jose Vazquez leaves a candle at the ghost bike memorial for Andy Garcia, killed in a vicious hit-and-run in 2013. Sahra Sulaiman/Streetsblog L.A. Established via council motion 14-0444, the LAPD will now publicize hit-and-run crimes via a new alert system. The alerts will be distributed via LAPD social media, including Nixle, Twitter, and Facebook, to enlist the public’s help in apprehending suspects who flee the scene of hit-and-run crimes. Alerts will be dependent on the severity of the crime, and will be targeted to areas in and near the LAPD division where the crime took place. They will, of course, be limited by the information available, such as the license plate, vehicle, and description of perpetrator. Medina [Hit-and-Run] Alerts have been in place in the City of Denver for two years and in the City of Aurora for one, and are issued in severe or fatal hit-and-run collisions when a description of the vehicle involved is available. Medina Alerts enable authorities to quickly broadcast information about a hit-and-run collision to the public on highway signs and through the media. In Denver, the city has also partnered with cab drivers and others who spend their working hours on the road, and alerts them when a collision occurs. Denver has issued 17 Medina Alerts since enacting their program; 13 of these cases have been solved. Established via council motion 13-0025-S1, the city will now offer rewards to individuals who come forward with information that leads to the conviction of hit-and-run crimes. Councilmember Buscaino describes this as an attempt to “change the culture of driving away” from a crash. These rewards are now standard for all hit-and-run crimes. In the past, families often had to pressure the city to set reward amounts in these cases. Councilmember Englander mentioned a planned “phase 2” in which the LAPD will work with additional vehicle dispatchers, both public (such as the Bureau of Sanitation) and private (such as taxis and ride-hailing companies) to further disseminate hit-and-run alerts. Englander also stated that the city is continuing to work with State Assemblymember Mike Gatto to create a statewide hit-and-run alert system. Gatto attempted to create one last year but, though his bill passed the legislature with broad bipartisan support, it was vetoed by Governor Brown. Gatto has introduced a similar bill, A.B. 8, in the current legislative session. Damian Kevitt, the hit-and-run crime survivor who founded Finish the Ride, welcomed the city’s latest efforts to shed its notoriety as “the hit-and-run capital of the United States.” Kevitt encouraged drivers to “have some dignity” and always remain at the scene of a collision. Finish the Ride will be hosting its Ride, Run, Walk n’ Roll event on April 19. The annual race raises funds for Finish the Ride’s advocacy efforts toward preventing hit-and-runs and making streets safe for all. Typical city council…why do something to prevent hit-and-runs (like slow streets down, physically separate bicyclists from motorists) when you can offer a large sum of money to catch the crook that leaves someone else for dead? It is very hard to be happy about this when the same council members that unanimously voted for this will block measures like road diets. I suppose it’s a start … but that’s all it is: a start. You’re right that the Council needs to ensure our streets are better engineered to improve safety for those of us not in cars. Catching hit-and-run offenders is good, but it’s better to have roadways that limit the number of collisions in the first place. You’re not looking at the root cause. Why are we having so many hit and runs? Addressing roadways is nothing but a patch fix. Road diet is not complete answer but when a street is designed to prioritize speed over safety is it little wonder that people get run over? There are too many streets to have adequate enforcement around the clock. If streets prioritized bicycle and pedestrian safety there would be far fewer hit and runs and there would be far fewer people driving in the first place. Yes, it’s a start, we do need to change how we treat hit and runs. It is a serious crime and glad city is doing something but… as you say, it’s better to have roadways that limit number of collisions in first place. Understand what you are saying but you are still only looking at a tiny part of the equation. For example, WHY don’t we have more priorities on people instead of cars? Could it be the spatial arrangements of cars, buildings, and people? Can it be because we have prioritized cars due to sprawl? You know, road diets work better it seems when we also create dense walkable areas that cater to people. There’s a reason why roads are clogged with cars in the first place. It’s called segregated land-use policies and sprawl. With this framework people are heavily dependent on cars and one unintended consequence, it seems, is the social disconnect associated with it. Hit and runs is symptomatic to this and is also exacerbated when you have illegals (licensed or not) trying to avoid further financial or legal troubles when a car is hit. Nice try with the road diets. That seems like a solution by “design”. What’s not mitigated by that however is people’s reliance on cars to get to where they need to go. Shrinking roadways or what not is a draconian solution when implemented as a stand-alone tactic.